SAN FRANCISCO — The Ainu are an indigenous group of peoples from the Hokkaido region of Japan and the Sakhalin and Kuril Islands of Russia. Ethnically, they share a common ancestry with Amerindians, Tibetans and the people of Okinawa. The “Utari: Ainu, Aboriginal People of Japan” showcase will present selected works from the Joseph G. Gerena Collection exhibited by Patrick Mestdagh and Marjorie Levin at the San Francisco Tribal & Textile Arts Show from Feb. 18 to 21 at Fort Mason Center, Marina Boulevard and Buchanan Street in San Francisco. 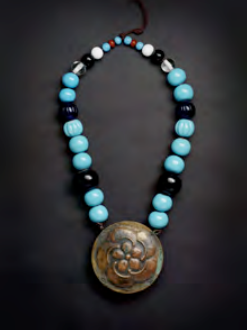 Copper and glass necklace (shitoki). Edo/Meiji period, c. 1860-1880. The Ainu showcase is curated to provide viewers with an opportunity to discover the relatively unknown aboriginal civilization of Japan. “Objects chosen from the Gerena Collection of Ainu Art demonstrate an expert and discriminating eye. In this collection we see a visual cross-over with artistic expressions from Mr. Gerena’s other great interests: Animal style art of the great Eurasian Steppes and ancient Eskimo art of St. Lawrence Island,” states Thomas Murray, Asian & tribal art dealer and author of the introduction to the exhibition. 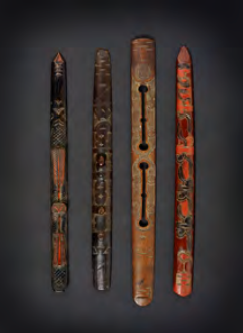 Ainu art and objects are extremely rare and highly sought after by museums and collectors. More than 50 rare items will be on view, including ikupasuy ritual prayer sticks, jewelry, weapons, textiles, and household wood pieces, as well as a grouping of historic photographs and postcards. The word Ainu means “the people.” While men were known for their thick beards, Ainu women historically displayed deep blue tattoos around the mouth, a process first begun in childhood and fully completed when a girl came of age. They dressed in robes woven from the inner bark of the elm tree. 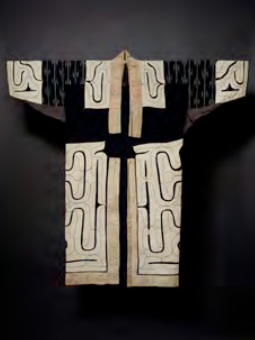 Various styles were made, but generally consisted of a robe with straight sleeves, which was folded around the body, and tied with a band about the waist. Traditional Ainu culture was quite different from that of Japan. They lived very close to nature and survived through hunting, fishing, and some limited agriculture. Their deeply animistic belief system held that spirit forces, kamui, permeated all natural things – fire, earth, mountains, land animals, fish and plants. Bears were especially highly valued – worshiped yet also sacrificed. The San Francisco Tribal & Textile Arts Show is the only vetted exhibition of tribal art in the United States and is considered the top tribal art event in North America. The 2016 show will feature more than 80 dealers in tribal and ethnographic arts. The San Francisco Tribal & Textile Arts Show is being held in conjunction with The American Indian Art Show/Marin. The San Francisco Tribal & Textile Arts Show will open with a 30th anniversary cocktail Party on Thursday, Feb. 18. Public hours are Friday and Saturday, 11 a.m. to 7 p.m. and Sunday, 11 a.m. to 5 p.m. Admission: $20. “Top Picks” Tours with Cathryn M. Cootner, emerita curator of textiles, Fine Arts Museums of San Francisco, will take place on Feb. 18 and 19. For additional information or to register for a tour, visit www.sanfranciscotribalandtextileartsshow.com.